For 99% of the civilized world’s population, buying a house is the largest financial deal they will ever make. It affects quality of life, safety, social life, monthly bills, and long-term financial health. Going into a closing process blindly will undoubtedly bring both emotional and financial stress to concerned parties; however, there are ways to prepare and things to know so the transaction is not only much less stressful, but also exciting—a day to celebrate. 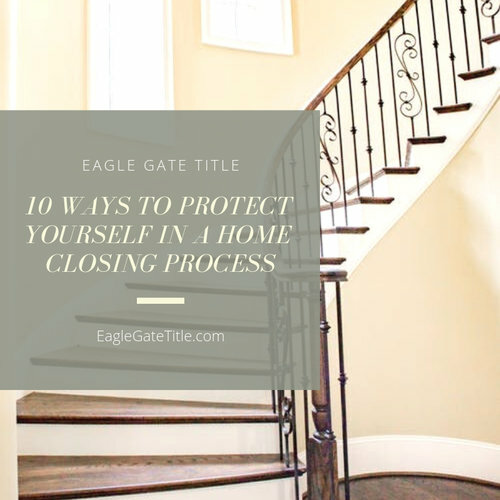 This article presents ten ways to protect yourself in the closing process of buying a home. It would be irresponsible not to mention of the effect that buying a home can have on personal relationships. So, if you have a spouse or partner, they should be in agreement with the purchase and aware of the terms in the transaction; otherwise, you could be headed for trouble. Talk, listen, ask, listen again until you understand your partner’s point of view, read this article, and come to consensus on the purchase before entering the closing process. 2. Get a pre-approval letter from a mortgage lender for a purchase price you qualify for. This not only helps you decide on your suitable price range, but also strengthens your offers when the sellers see your ability to get financing. 3. When you are ready to make an offer to purchase a property, hire a real estate agent to monitor things from offer to the closing process. Share wants and needs so he or she can offer smart suggestions to avoid unnecessary headaches. 4. Next, open an escrow account, usually through the help of your real estate agent. The escrow account is held by a third party to protect the money of both the seller and the buyer (including earnest money submitted with the offer). At the right times in the closing process, the neutral, custodian of the escrow funds will distribute them properly. 5. Do a title search, and obtain title insurance. These protect you from any liens against the property, ownership claims by another party, and any hazards which may be contained in the property itself. This step in the home closing process is a must. 6. Lock in a good interest rate. Mortgage loan rates fluctuate, so check them regularly, and lock in a rate with your lender when the interest rate is satisfactory to you. 7. Order the inspections—both home and pest. A home inspector will visit the house you want to buy and search, thoroughly we hope, for problems that need repair. A pest inspector will look for signs of termites, carpenter ants, and any other critters that may have or will damage the structure. After getting the results of the inspection, you can renegotiate the price of the house or ask the seller to pay for the repairs. 9. One of the last steps in the closing process before you sign the papers should be to walk through the property one last time. You want to make sure no damage has occurred since your last home inspection, the required repairs have been completed by the seller, no new problems are found, and nothing has been removed that is included in the purchase papers. 10. Bring three things to the closing appointment: your real estate agent, your money, and your wits. Your agent or mortgage lender can clarify any questions which might come up. If you have any closing costs or if you need to pay a down payment, usually a wire transfer is required. The title company will coordinate that in a safe and secure manner. If you come prepared and have read the closing disclosure, you can be calm and happy about the event.